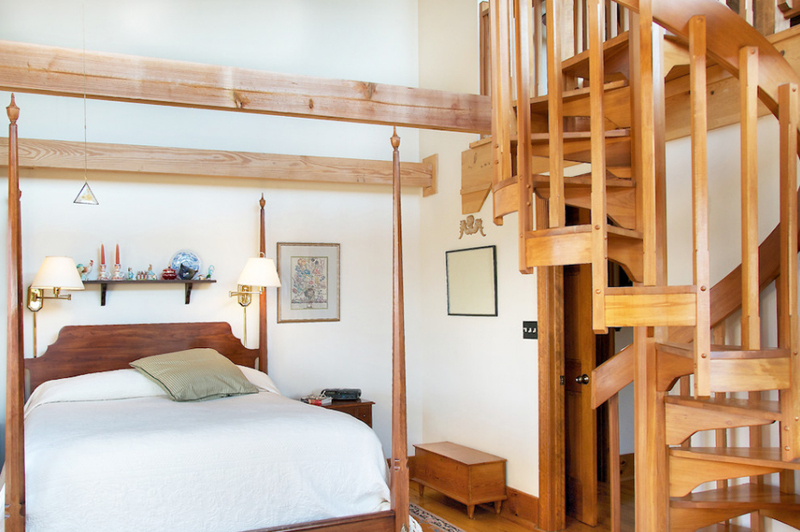 It is nice to add a spiral staircase in the bedroom. Here are some ideas for you. 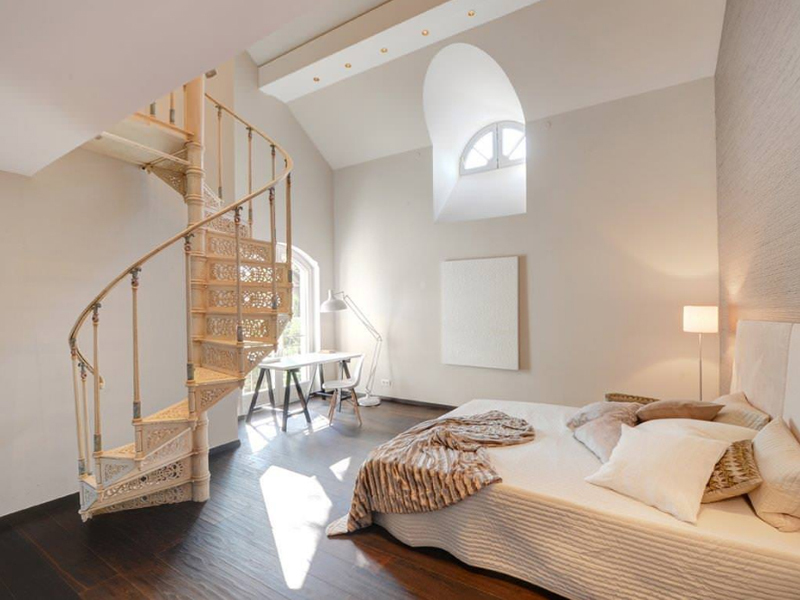 A while back, we have created a list of beautiful bedrooms with stairs in them – some were loft bedrooms, some has decorative stairs in them while most of them really had functional ones. 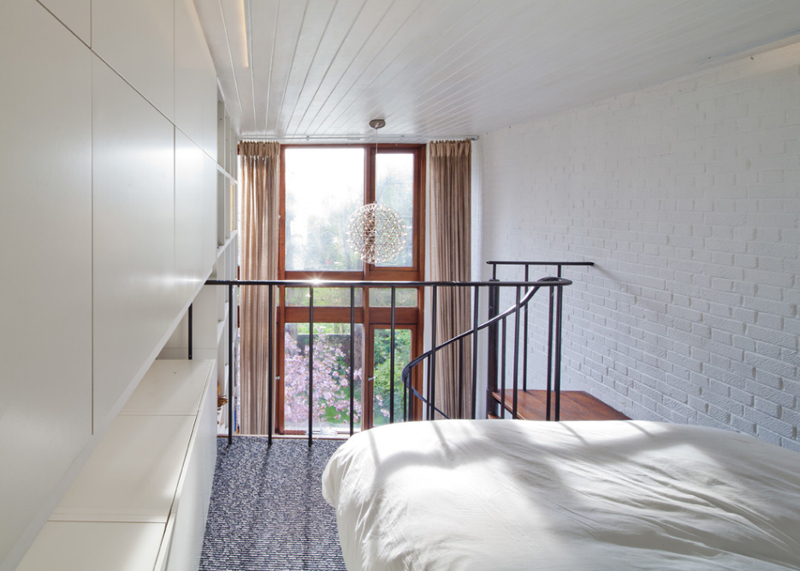 For the most part, bedrooms that have staircases or stairs in them could mean that they have a space above it – maybe a patio or a veranda or even a small home office, sometimes, it could mean that the bedroom itself is found at a lower portion of the house – maybe a basement or otherwise, just a lower level in the house. 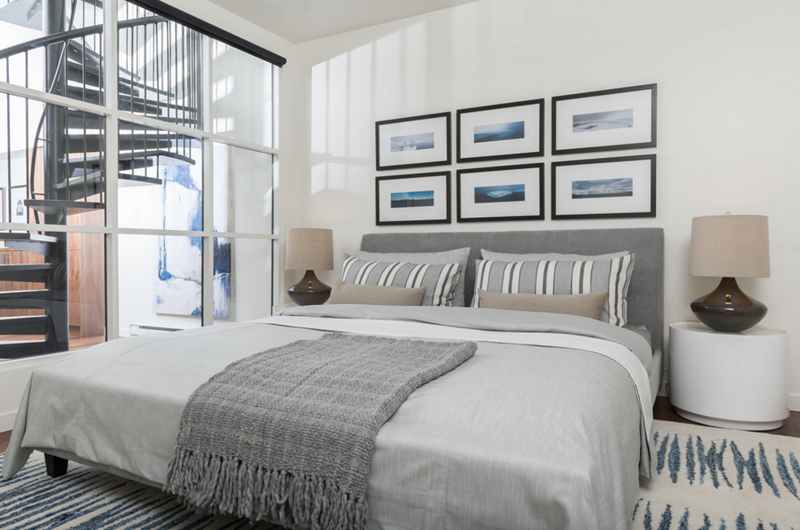 For today, we have a list that would cover most of the designs that one could want for a bedroom located below ground or spaces that could have functional spaces about them! For some of the photos in here, it’s even possible that they have secret lairs in them because the user of the bedroom actually wanted one – who know? But, let us go ahead and check out the spaces ourselves! This is one bedroom that I think deserves to be in the beginning of this list! The space is in white – it looks heavenly and really fascinating! I know maintaining a bedroom this clean is a lot of work, but I think anyone won’t mind because it just looks wonderful and cozy! Seeing the peace logo on the wall made might make you assume that the owner of this bedroom is some kind of a hippie or something. Of course that is something only crazy people would assume to be since this place looks incredible! The design is quite comforting and really awesome! 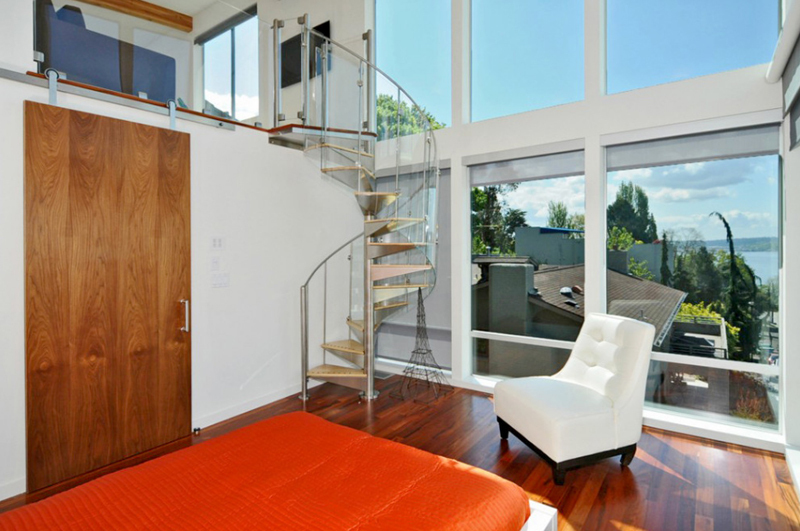 Oh I adore the design of the spiral staircase of this bedroom! The details on the metal steps are just fabulous and fancy! It delivers both a look of class, vintage and sophistication! Totally what this bedroom could need! This cute bedroom sure has a lot going on. It’s safe to say that this space is much like an apartment or a pad that does not really have a lot of partitions but you have everything that you could possibly need – a dining area and a kitchen, a bathroom, a living area and even additional space on the attic. 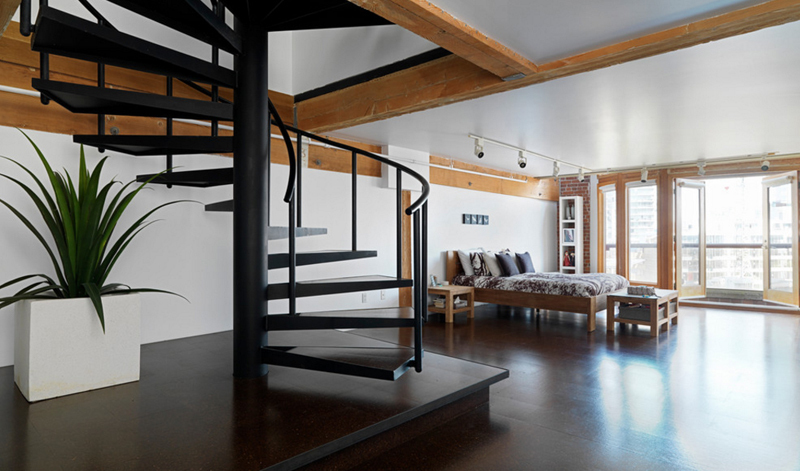 This urban loft has quite a nice and comfy look to it. This bedroom sure does not have a lot going on but it seems like this is indeed enough for you to actually want to rest and stay inside this room and have a long relaxing sleep. Doing a bit of yoga or exercise might be a great thing too! Well, it looks like this house has this fascination for white since it looks like they really chose white for the walls and the ceiling; of course this is not bad or anything, it’s just nice that they incorporated other colors in here like the browns – as seen on the flooring and on the door and a hint of orange as seen on the bed. 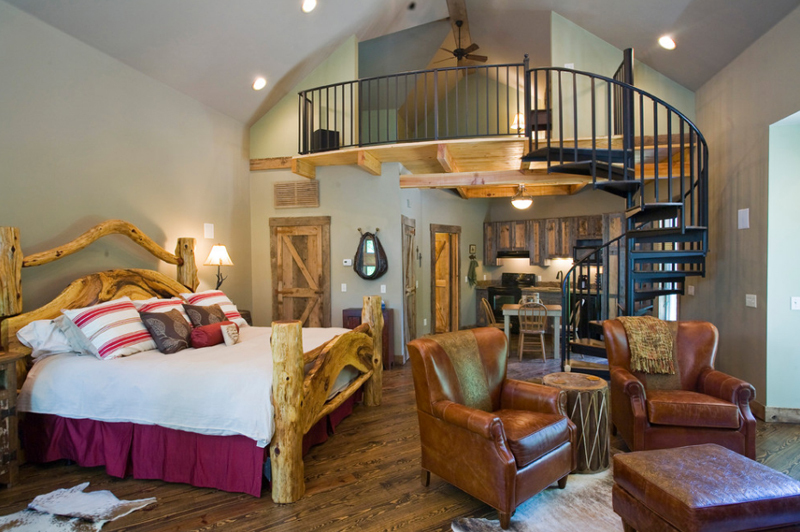 Check out the bed frame in here – it sure is pretty cool, not really unusual since this is something that a few people with summer homes, cabin or log cabins have; of course, there are cabin homes that are more contemporary than others. This guest house on the other hand is bringing the cabin feel to a contemporary lake house. This bedroom could possibly be in a basement or lower level of a house – like below a living space of something and it looks totally awesome! The wood work is lovely, the furniture and decorations looks special. This sure is one stunning Belsize park flat. 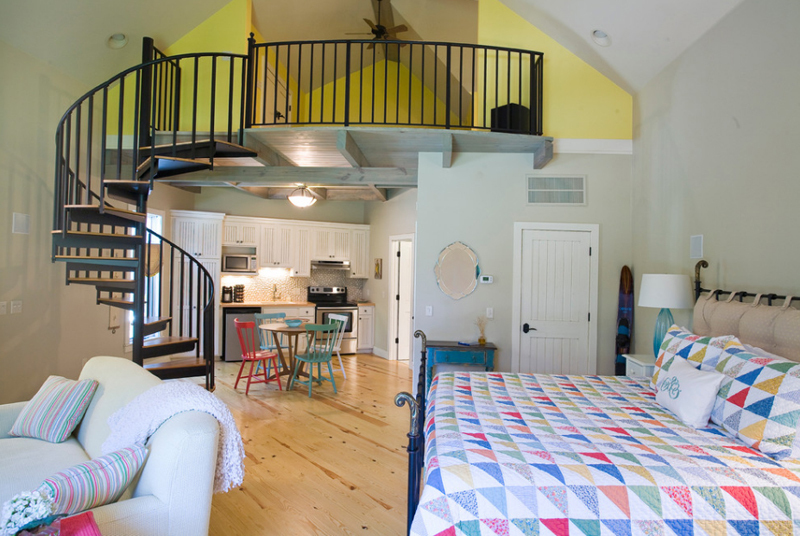 It has that loft feel that is quite comfortable and cozy even just looking at it! The white walls, cabinets and ceiling have these cool textures to it that makes it interesting and quite cool. Without a doubt, the stairs in here is made of wood and from what is seen in this photo, I think it looks really nice. 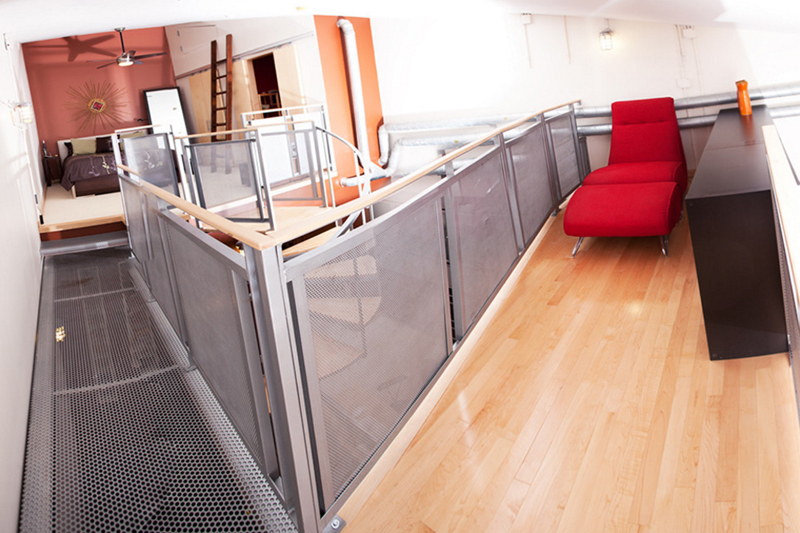 This loft sure has one large space in the bottom! I think this space needs a little bit more staging, but if the goal is minimalist, then I think, the designers already has this space covered! I love the shiny flooring and the large windows, and the fact that the spiral staircase has a raised stage for it – pretty awesome, actually! This is one stunning space that rich people live in. It has that French look and feel that only classy people actually could comfortably live in. I mean, I wouldn’t mind living in a beautiful home like this one, but I think that this is too much to maintain. This cabin home looks like something the three bears in Goldilocks live. 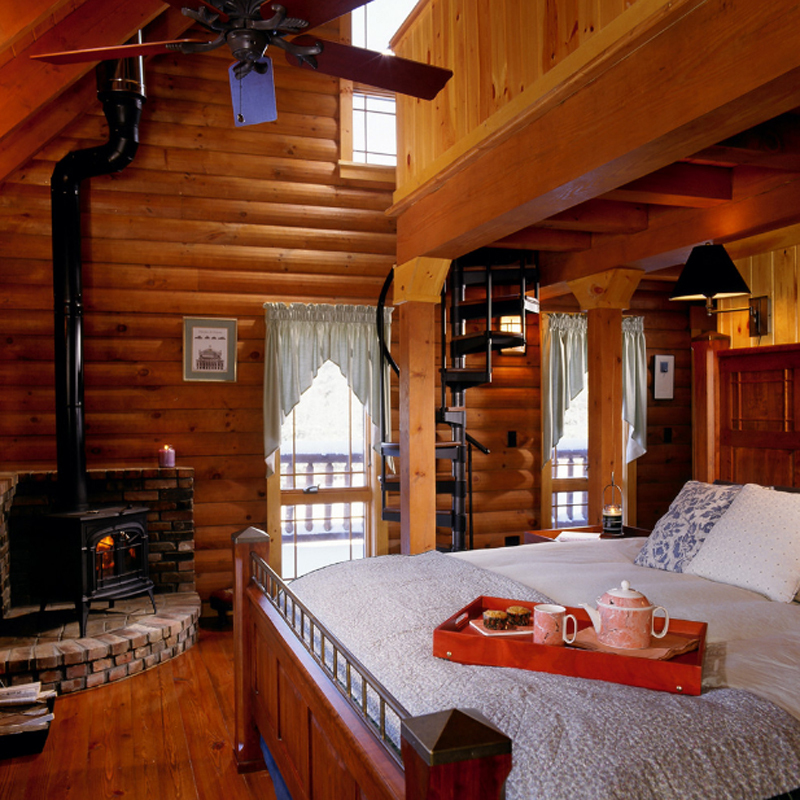 With log walls and a lot of wood work on the upper deck of this bedroom – and even with the bed and the floorings, I think this place is definitely comfortable especially during the cold season. The wooden spiral staircase actually looks really pretty and I love it! 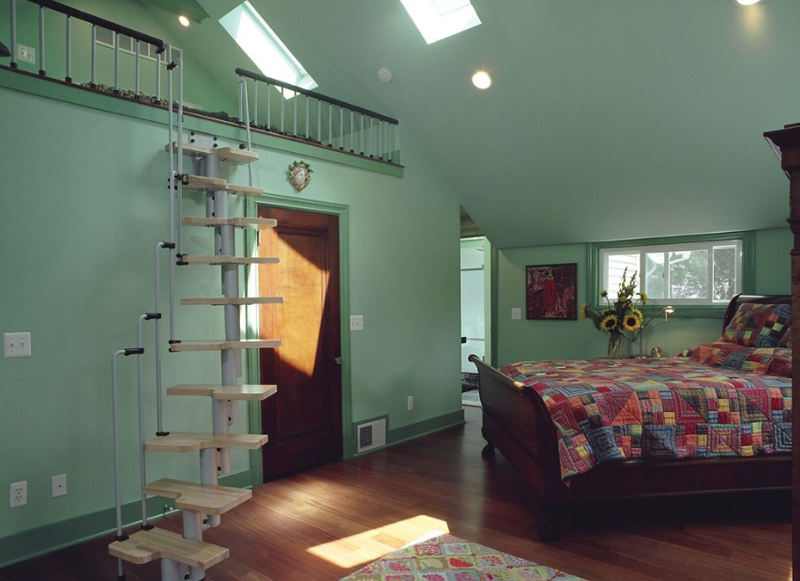 The color of the stairs doesn’t really match with that of the four poster bed, but it still looks cool and homey. Contemporary spaces that somehow look traditional are stunning spaces that people actually look out for! 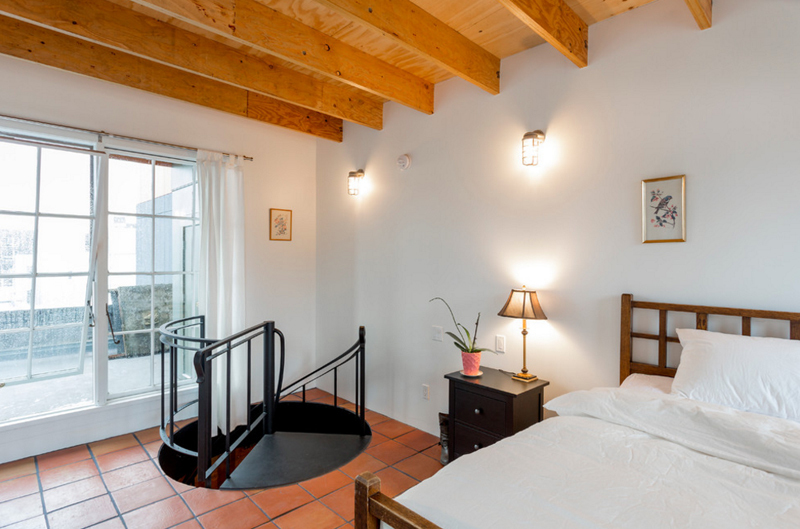 This is one of those bedrooms that I was telling you about in the beginning about having spaces above your bedroom area wherein you could actually hang out. From this angle, I can partly say that the upper deck looks like an area that opens to a balcony or something – this sure is one nice space to check out the beautiful city lights at night! Being in a bedroom that looks as stunning as this could mean a lot of lazy mornings; with a comfortable bed, soft carpet and great lighting, sleeping in the evening would be something to really look forward to every day after work! This bedroom could really use some drapes, but then again, the glass windows are great alarms for when you actually have to wake up in the morning! The bedroom looks real cozy, so I don’t think sleeping in the evenings would be hard to do. 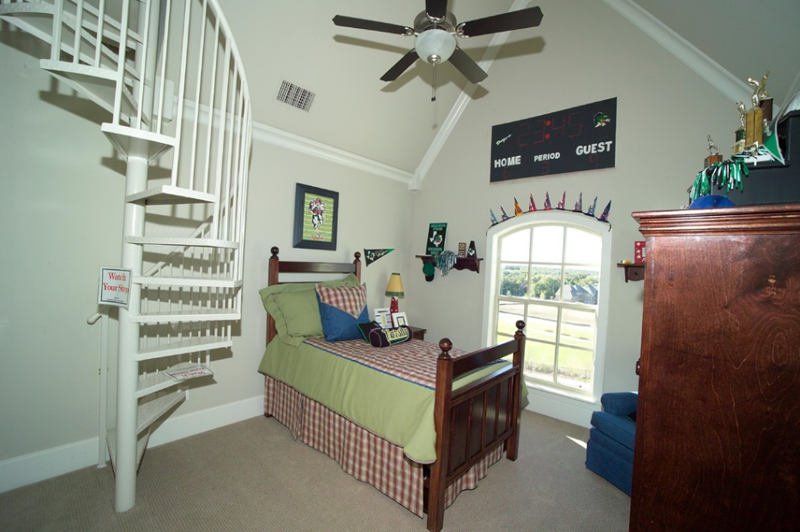 Here is one photo that could have looked great in this photo if the photographer took the time to really make sure that this bedroom would look real perfect. 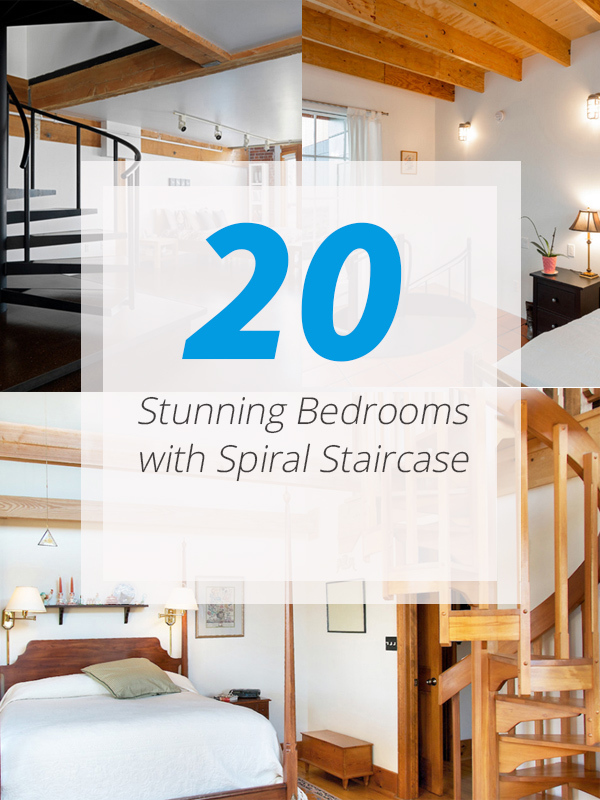 The spiral stairs look unique in material and design which actually looks nice and the color of the bedroom itself looks fabulous! When I saw this photo, I got a little bit confused because of the angle of how this photo was taken. 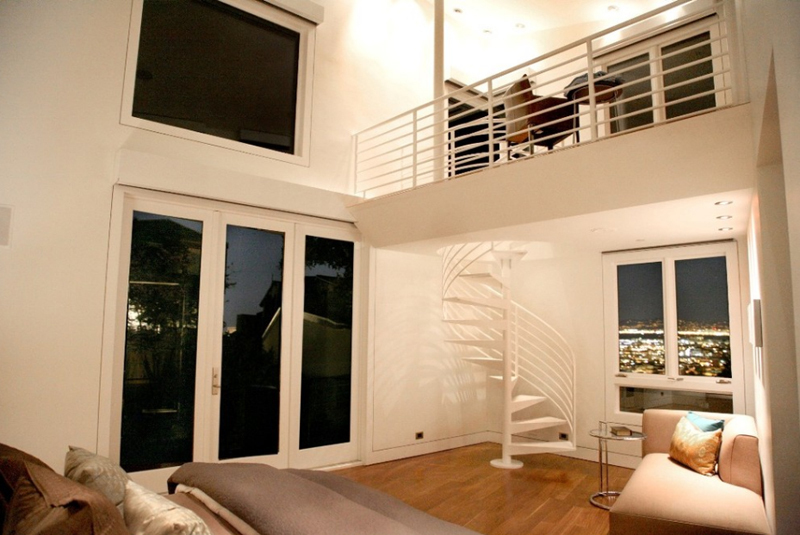 Although, it is quite obvious that they wanted to make us (viewers) see the entire space aside from the bedroom area, the spiral stairs and that of the small home office on this side where the red lounge chair is. I wish that they gave more justice to this bedroom than it was given in during the time that this photo was taken. The lighting looks a little bad and the color of this entire bedroom could have been prettier if they used warm lights when they took the photo. Too bad, but we see how much space there is because they chose a smaller bed. This small bedroom sure looks conducive to sleeping. With tons of drapes and possibly night curtains, bedrooms like this one are great for people who work during the night and sleeps during the day. 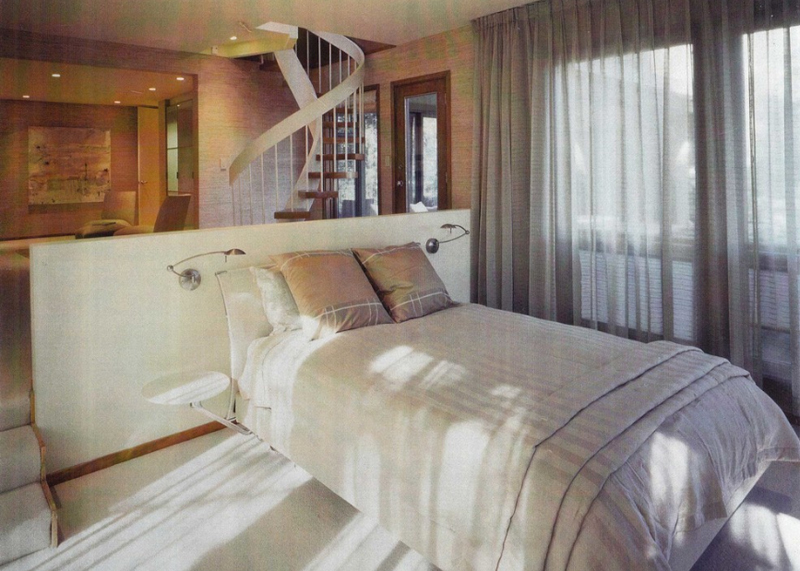 The head board of this bed sure looks an easy divider for the bedroom area and possibly a living space! 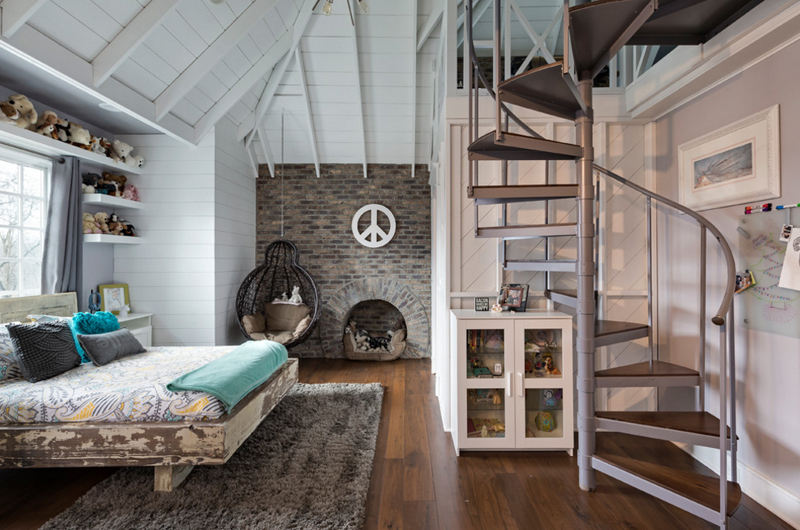 If you ask me, I think this list was incredibly perfect for homes that have attics in them – you could probably connect your bedrooms to the attic and create a small cozy space for you to hang out on or for your kids’ play areas. There are a lot of things that you could do with your spaces and that thought is just exciting! 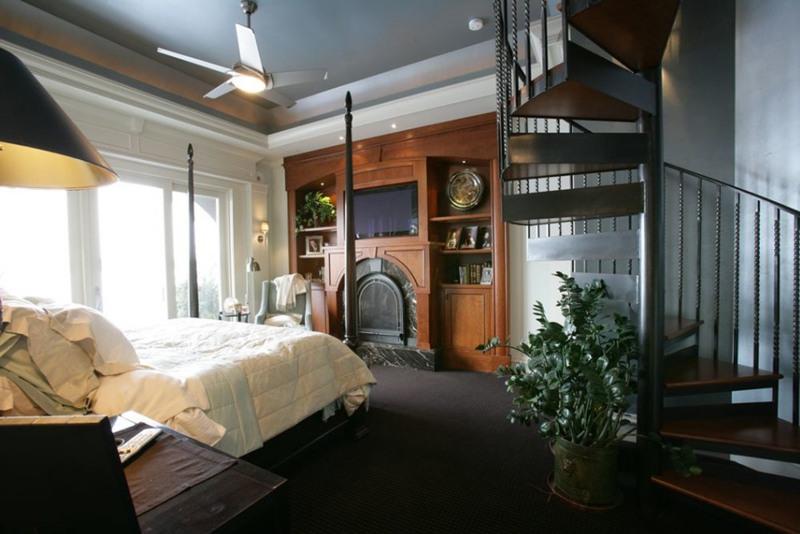 For more bedroom inspiration, you should check out the 20 Beautiful Bedrooms with Stairs and share them with your pals!